I am one of those people that make "new years resolutions." I never call them new years resolutions because that will doom them to failure, but I do make a list of goals for the next year. During the months of November and December I start making a mental checklist of things that are important and the best of the bunch makes the list. One of the things that made it on to my list of things to do in 2013 was Final Fantasy IV. My list does have the ability to be awesome upon occasion. I started my new play through of the game last week and currently am about 8 hours into the main storyline. I just opened the Volcano and entered the Underground. I really love this part of... Read All I am one of those people that make "new years resolutions." I never call them new years resolutions because that will doom them to failure, but I do make a list of goals for the next year. During the months of November and December I start making a mental checklist of things that are important and the best of the bunch makes the list. One of the things that made it on to my list of things to do in 2013 was Final Fantasy IV. My list does have the ability to be awesome upon occasion. I started my new play through of the game last week and currently am about 8 hours into the main storyline. I just opened the Volcano and entered the Underground. I really love this part of the game and remember this is where it opened up for me in terms of the story, difficulty and grandeur. When I made it to the underground for the first time I remember feeling a sense of wonder at what was under the earth and the possibilities seemed endless. 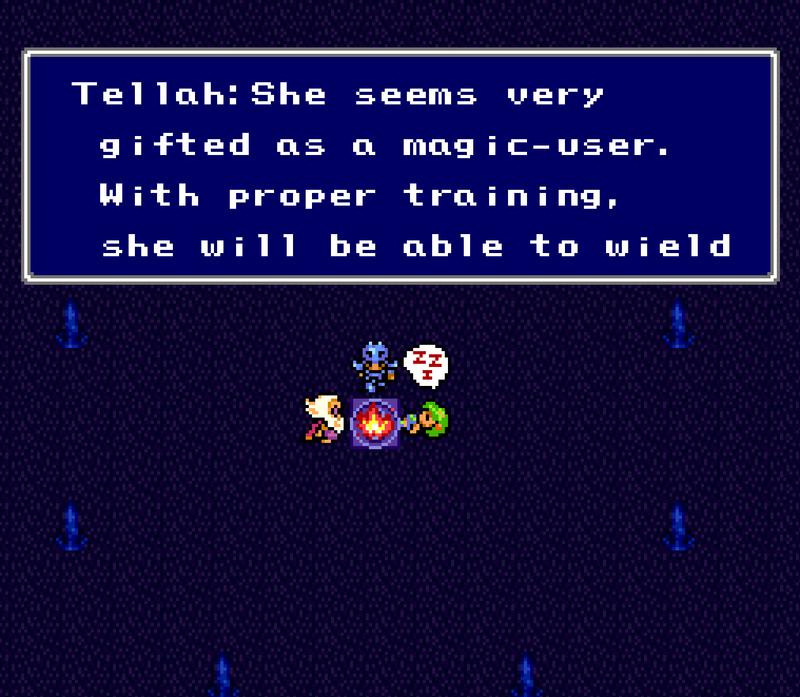 All that to say, I am having a great time replaying Final Fantasy IV. Getting a fresh take on this game is putting it in contrast in a way I hadn't considered before. One way is that the game moves through some really serious story beats very quickly. You go from the leader of the Red Wings to the accidental genocide of a village to each other major story beat in a very quick amount of time. Compared to a modern triple A game Final Fantasy IV blows you through huge set pieces at a blistering pace. The game achieves this with very little dialog and a ton of music and a lot atmosphere. The emotions the artists are able to convey with the sprites always impressed me and still do. Its interesting to note that Final Fantasy IV did this well but later games in the series that used the same Super Nintendo technology improved this even further. Its a credit the games artists that this still comes through now even though I have been exposed to very real looking 3D. That all said, if I had one nit to pick with the game thus far is that there is quite a lot of drama. The characters seem to only experience the highest of highs and the lowest of lows. There isn't a huge amount of subtlety in the emotional range here but that may be a limitation of the technology and the blistering fast pace of the story. It also may be the game designers trimming out the fat and only focusing on the core elements of the story that mattered the most to them. Either way, its noticeable and the game is more drama than I am used to. One of my friends likened it to a Soap Opera and I find the description to be entirely appropriate. The game is much more difficult than I remember. I have had to spend time grinding before certain areas and needed to be very strategic to survive between save points in dungeons. The game also mixes things up as seen in the Dark Elf Dungeon. The Dark Elf Dungeon introduces a mechanic that doesn't allow you the use of metal items or armor. This requires the player rely on other characters to pick up the slack and Cecil, who spent the majority of the game being very powerful is now way less useful. I never really understood why the game did that before but as I look at it now its a great design mechanic that causes you to change how you approach an otherwise normal dungeon. If you have been thinking about coming back to this or want to pick it up for the first time I urge you to do so. 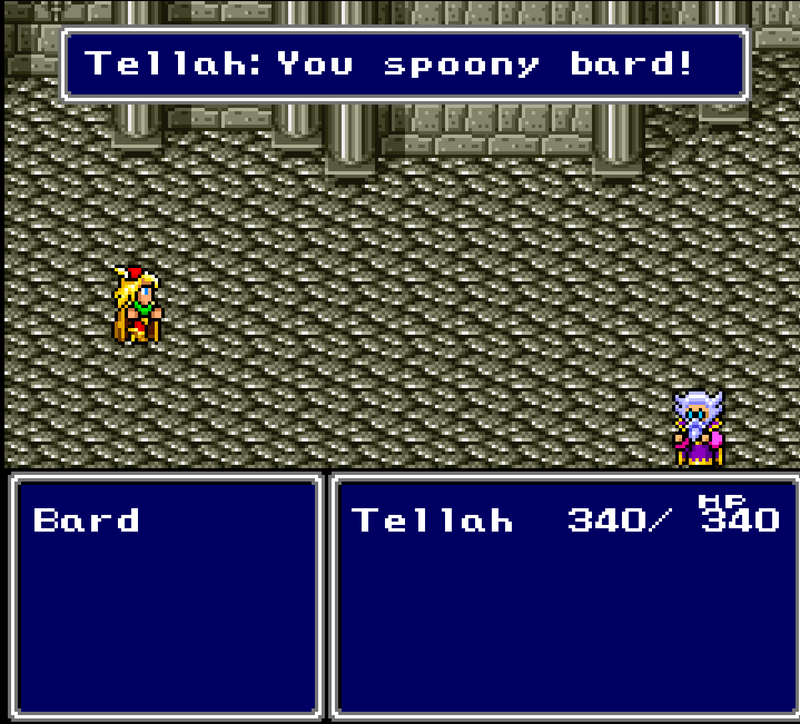 Because, really, don't we all want to play the Spoony Bard one more time?